An Historic Engineering Marker recognises the historical importance of the bridge which connected Darwin to the goldfields of Pine Creek. The Institution of Engineers Australia, through its Heritage Committees, established the Australian Historic Engineering Plaquing Program to acknowledge past engineering achievements and to draw public attention to the significant contributions they have made to society. The Plaquing Program is a means of bringing public recognition to significant historic engineering works and the engineers who created them. The Program is intended to contribute to the conservation of Australian engineering heritage. 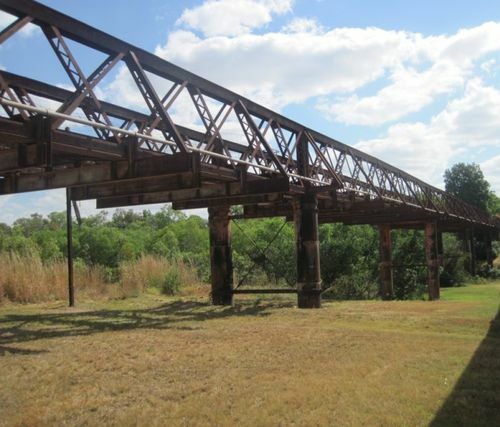 In 1886 a contract was signed between the Government of South Australia and construction firm C&E Millar to build the railway between Port Darwin (then known as Palmerston) and the goldfields at Pine Creek. By April 1888 the railway had reached Adelaide River. Construction of the 155 metres (509 ft) long steel girder across the river itself used five 31 metres (102 ft) spans supported on four sets of piers. The bridge was all but complete by the onset of the wet season later that year. The first train to cross reached the southern bank on 3 December 1888, followed five days later by the first scheduled service, hauled by the locomotive "Silverton".